‘If you haven’t been to Vallee de Mai, your trip to Praslin is incomplete’…we were told so…and now, after having spent a few hours at Vallee de Mai on the island of Praslin, we totally agree. There are some who believe that Vallee de Mai could be the original site of ‘Garden of Eden’. We really don’t know much about the authenticity of the statement…but we do know that a few hours amongst thousands of lush, green Coco de Mer palm trees will surely soothe your eyes and calm your mind. The seed of the Coco de Mer palm is the largest in the plant kingdom. The fruit, which houses the seed, can weigh over 30 kilograms… and may pop open to reveal two or even three seeds. Yep… twins and triplets do exist in the plant kingdom as well! That is the seed of the Coco de Mer! Seychelles is home to two UNESCO world heritage sites – Vallee de Mai is one of them …Aldabra Atoll being the other one. 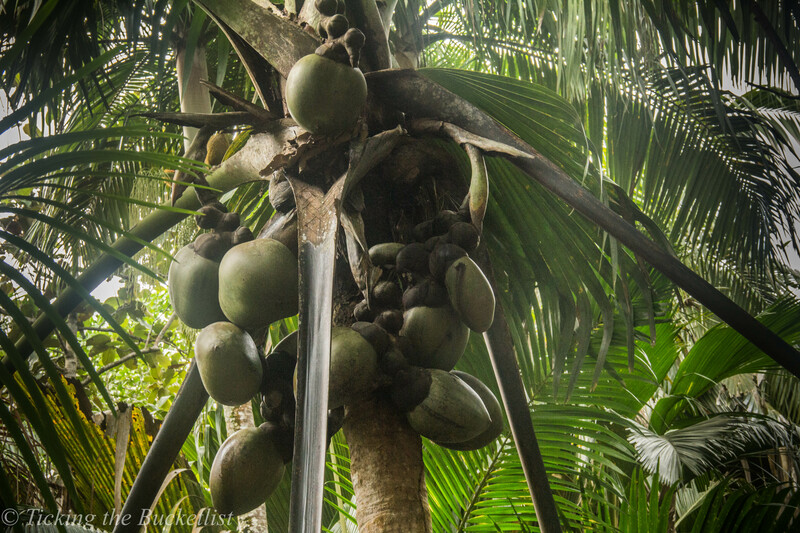 Vallee de Mai is home to over 25% of the world’s Coco de Mer palm trees. 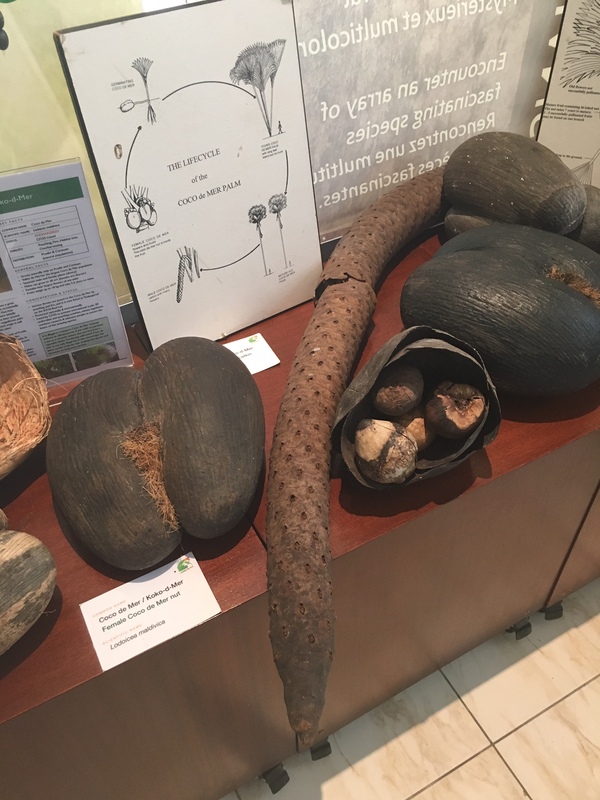 The Coco de Mer is a primitive palm, endemic to the island of Praslin and a couple of islands around Praslin (including Curiuse Island)… no where else in the world can you find this wonder of the plant kingdom growing naturally. 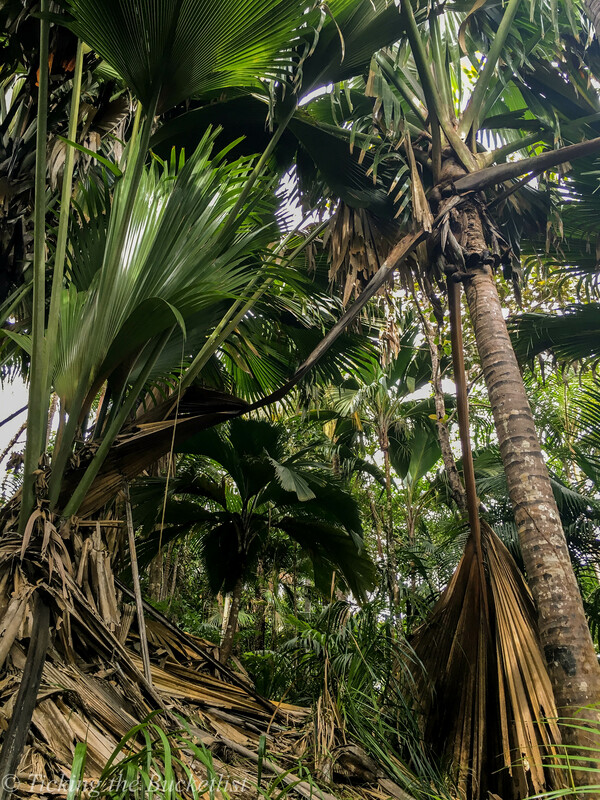 Besides the Coco de Mer plam, Vallee de Mer is home to five other endemic palm species – millionaire’s salad, thief palm, Seychelles stilt palm, latanier millepattes and latanier palm. Vallee de Mer is home to more than primitive palms… it is home to the black parrot! The black parrot is found only on the island of Praslin, living and breeding in the presence of the Coco de Mer palm. 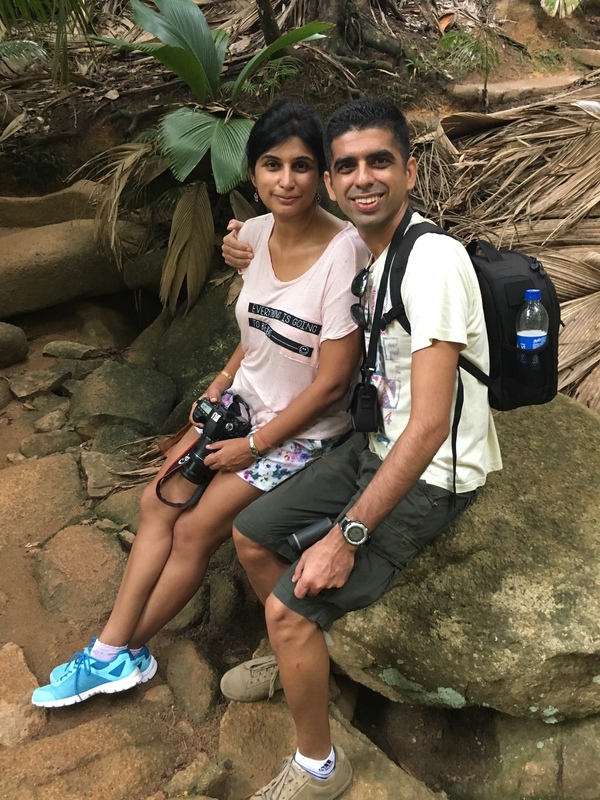 While we were there, we heard mating calls of the parrots – and it took us about half an hour to finally sight two of them! Lucky us! The national park is home to many more colourful birds including the Seychelles blue pigeons, which are indeed very pretty and the Seychelles bulbuls, which are the loud, cacophonous and territorial birdies around you. 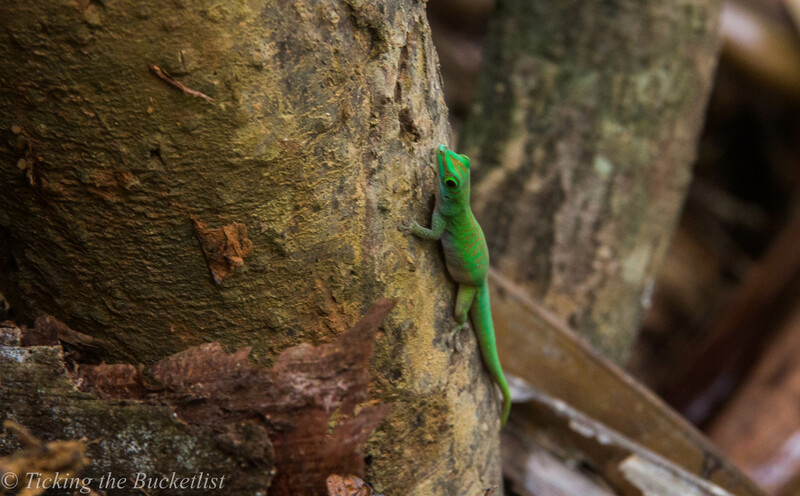 Let not the birdies take your attention off the ground and the trees, where you can spot the bright green day gecko and the Seychelles snail! Seeds of Coco de Mer were found by sailors and pirates floating on waters of the Indian Ocean and they believed that the seeds were those if a mystical underwater tree. Thus, the name Coco de Mer was coined… which means ‘coconut of the sea’. Coco de Mer can grow upto a height of over 30 meters… almost as high as a ten storey building. The palm has a frond of green leaves at its head with leaves as large as 4.5 meters. The life of a Coco de Mer is typically between 200 – 300 years! The male catkins can reach upto a length of 1 meter…amongst the largest in plant kingdom. The fruit of the Coco de Mer typically takes 6 -7 years to mature followed by 6 – 18 months required for germination. A female tree, at one time, can bear over 6 fruits, each weighing over 20 kgs. That sure is a lot of weight bear for any mom! 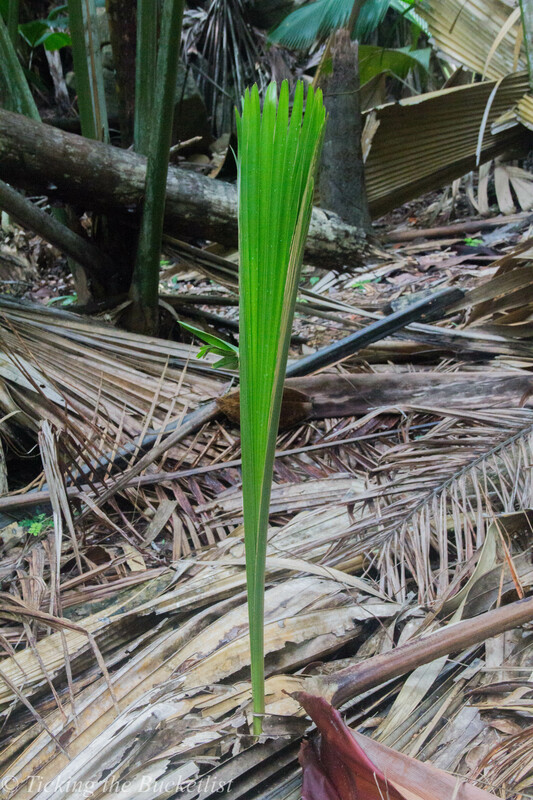 The leaves at frond join the trunk in a funnel shaped fashion, ensuring that all precipitation is collected and channeled to the roots of the Palm. The palm, regardless of the weight it carries, has some ability to twist and turn when the winds are strong. The trunk sits into bowl shaped structure that has hole to allow the roots to pass through…very similar to the ball and socket joint, which is held together by muscles. The ‘bowl’ ….to let the tree ‘twist and turn’ when the winds hit hard! The juiciest bit is saved for the last! Coco de Mer seed is considered to be an aphrodisiac… thanks to its shape, though scientific studies still have to confirm the same. Gossip magazines say that the fruit was offered to Prince William and Kate when they were in Seychelles! First and foremost, hop onto a ferry to get to the island of Praslin. We rented a car on the island of Praslin and drove to Vallee de Mai from our guesthouse in Cote d’Or. The drive took about 15 minutes… actually a little more than that as we stopped enroute at a local grocery shop to pick up a snack. Vallee de Mai can also be accessed using public transport i.e the local bus service. The bus stop is just a a few steps away from the entrance gate. How much time to budget for exploring Vallee de Mai? 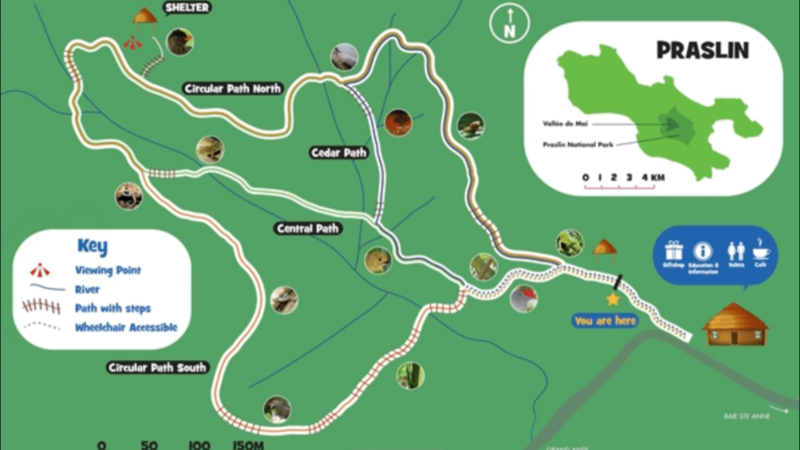 There are three trails that can be used to explore Vallee de Mai… Cedar trail, Central trail and Circular trail. 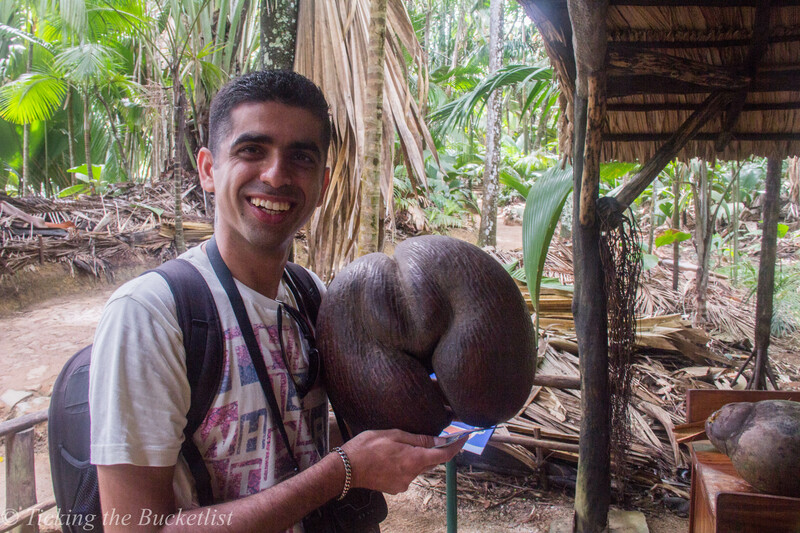 Most tourists end up doing only a part of the Central trail within an hour and head back with only a peek into the world of the Coco de Mer. However, to ensure that you have plenty of photo opportunities, soak in the atmosphere and spare some time for bird watching, we would suggest that you budget about 2 hours on the Cedar trail. We went till the ‘Shelter’ on the Circular trail which was a great viewing point to see Vallee de Mai from an elevation. Plenty of friendly birds visit the shelter during the morning and evening. The entrance costs EUR 20 and is payable in cash at the ticket counter. A majority of this money is used to maintain both the world heritage site – Aldabra and Vallee de Mai. You are provided with a little pamphlet that has a map when you buy the ticket, which will help you determine which trail you would want to take. Are there any guided tours inside Vallee de Mai? 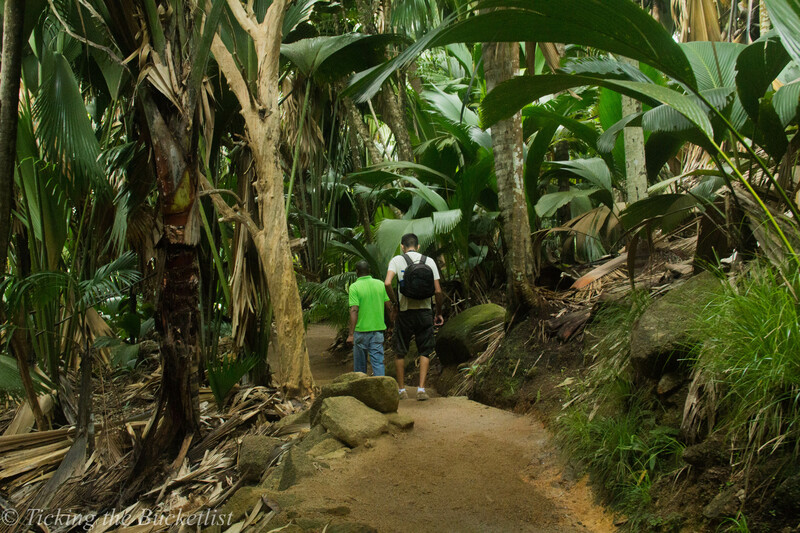 There are free guided tours provided by SIF (Seychelles Islands Foundation). It would be best to contact them a few days before you come to check the timing. We would highly recommend the guided tour. We were with Marc, the site manager who knew so much about the site and had lots of interesting things to share about Aldabra as well. Had it not been for Marc, we would have never been able to sight the geckos, snails… and most of all – the black parrot! What facilities are available at Vallee de Mai? There are clean toilets close to the entrance… but none inside the park… keep that in mind. Souvenir shop, which was very reasonable… much cheaper than any other souvenir shops that we ventured into. 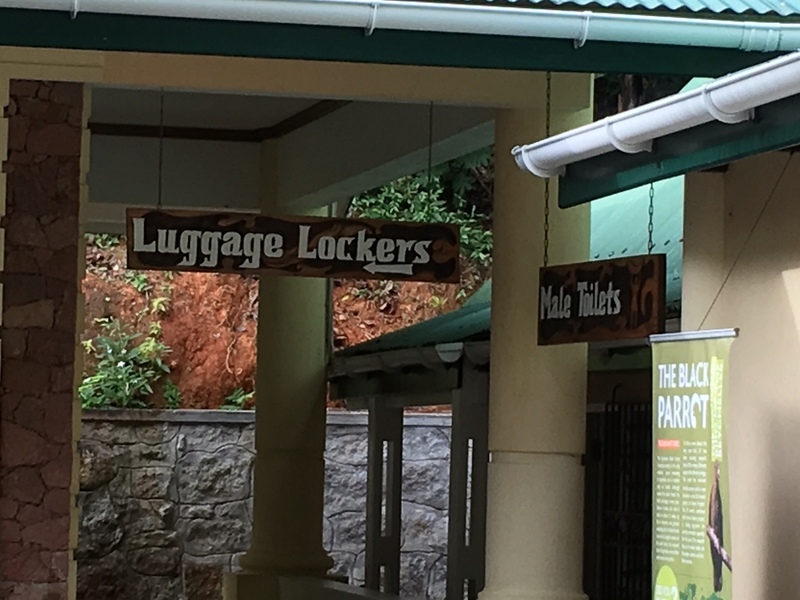 Left luggage facility is available for large and small bags. Two cents from our end… Some tips…. Download the app on your phone (Apple) to help you plan your trip better. Click here for the app. He he he! Well…you have your imagination to figure out what it looks like!